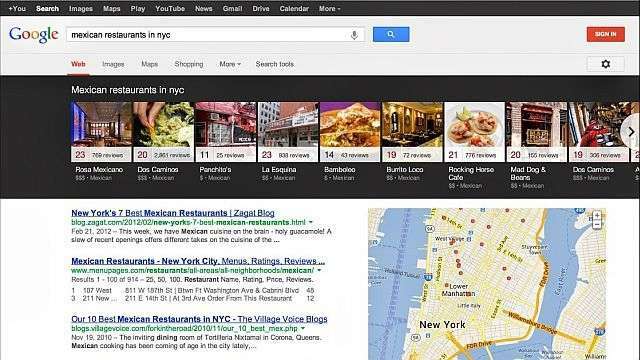 Google search is experimenting a 'carousel' type display so the next time you search for Indian Restaurants in New York you will get a 'carousel' at the top just like the one I have on top of this article. But Google being Google the 'carousel' will be super interactive and refined giving you the details of the restaurant, reviews, scores telephone numbers and addresses, which will help you find the best fit for you and families dining needs. iPad already has this feature since December along with some other tablets. The feature works in a simple way. Your search input is say, French Restaurant on Google Search. The result page will have a carousel of establishments, complete with their images for you to view. It will contain several details about the restaurants, including its overall review-based score and address. It will also serve as a additional pep up to the local eateries to be on Google Search, giving them their two minutes of fame. Though it is not clear whether Google will monetize this search results, but a definite revenue stream for Google. The feature will only be available for US markets as of now but pretty soon the regional Googles will also have it.